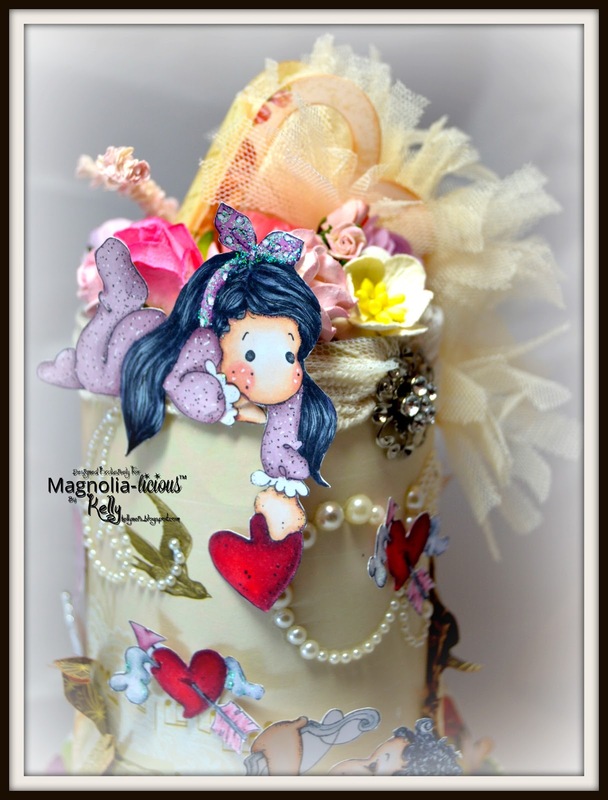 THE BEAUTY OF PAPER: Magnolia-licious Challenge "Love is in the air"
Magnolia-licious Challenge "Love is in the air"
Hello and Welcome to the Magnolia-licious Challenge "Love is in the Air"
The images I used are "Tilda with Dot bow" and "Bonny Tilda", both are colored in Copics. On Tilda's outfit I used a Gelly roll pen and a Micron 01 pen to make the white and black dots. I found this very pretty tulle and pearl piece at Hobby Lobby and it fit perfectly around the base of the hat. To dress the bottom up more I added a few pearls and flowers. 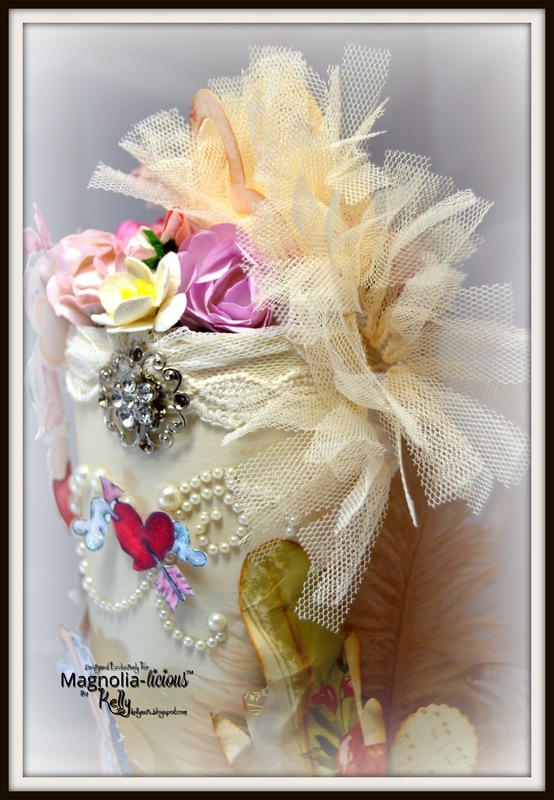 The top of the hat is covered in lace with a Memory Box heart box die, which I put tulle inside so it would cascade out of the heart box and down the side. I also used WOC, Magnolia and Kort and Godt flowers on top. 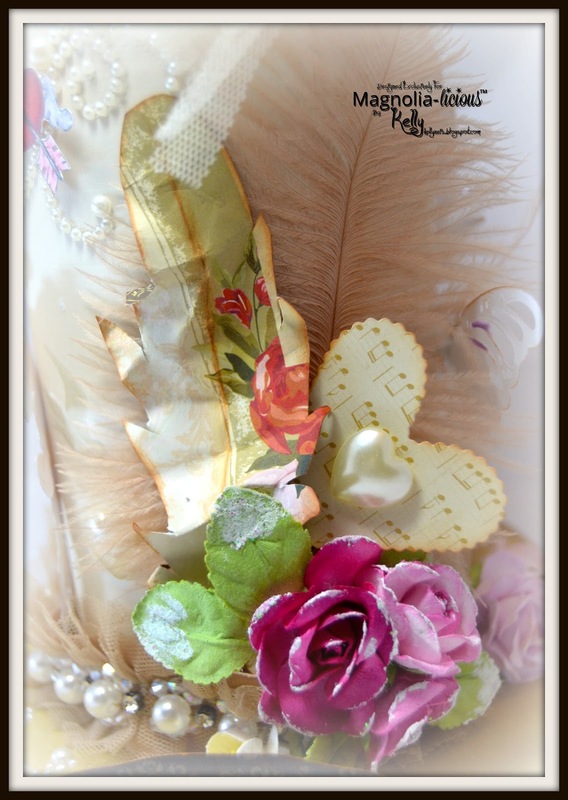 I cut our the paper feathers and distressed them a bit and then added it to the feathery taupe feather along with gorgeous sugared Prima flowers. 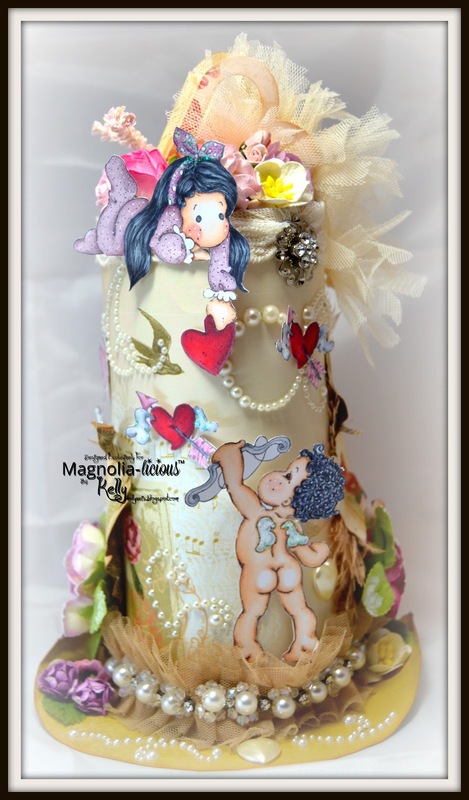 Here is the back of the hat with some hearts, pearls and the Doohickey die, large butterfly. 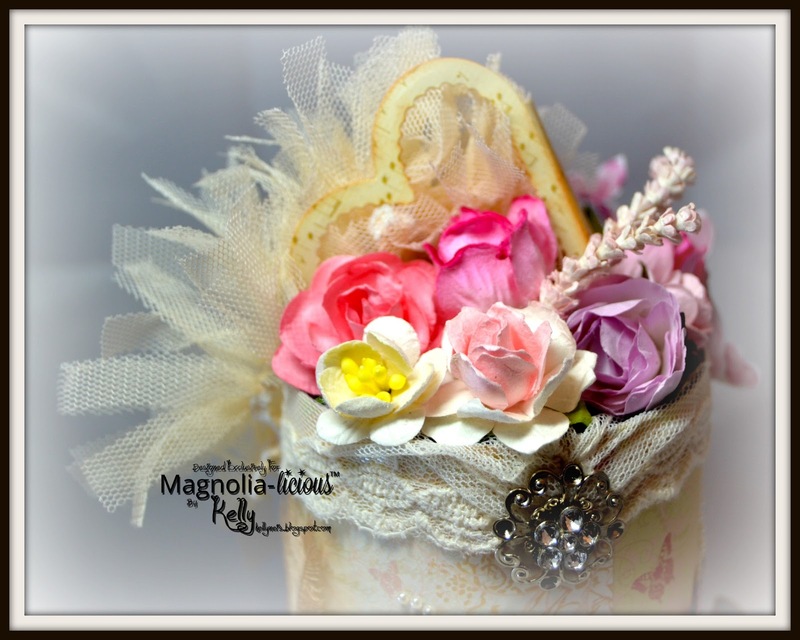 I love those little Magnolia hearts. 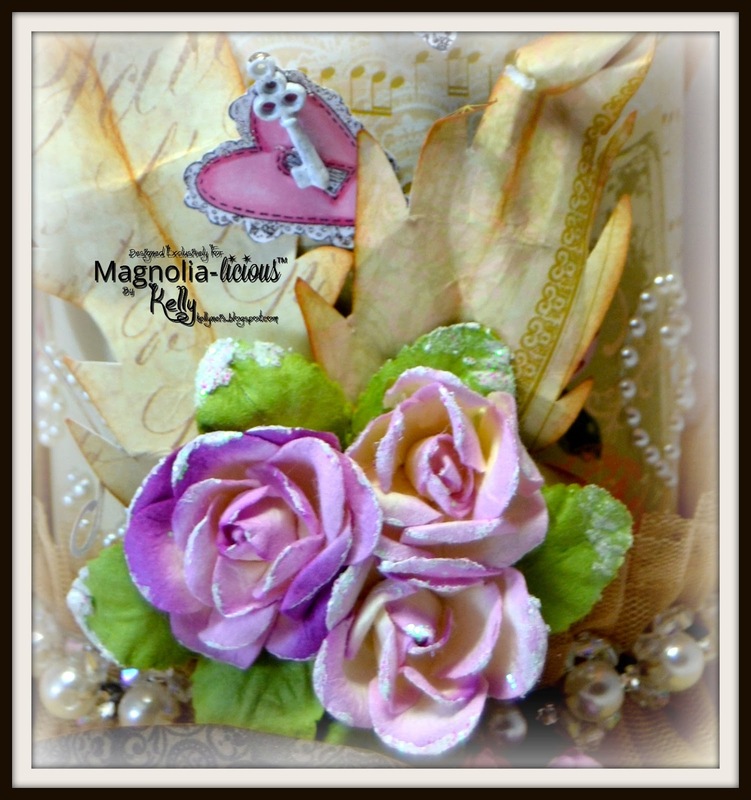 On one of the hearts I Frantaged a metal key with Shabby White. My top hat was destroyed by our playful kitty. She climbed up to my shelves on the wall and had a lot of fun with this hat, lol thankfully I had this photographed for my DT post. Don't forget to share a comment on the Challenge Posts & "W"ednesday posts. If you leave comments on the DT girls blogs and/or the posts on this challenge blog...you will be ENTERED to WIN!! The more blogs you comment on for each challenge or post, the better your chances to win! blogs/posts will be chosen to win a prize! Comment winners are posted every Wednesday! Please make sure to add your email if you post comments anonymously so we can contact you...thanks! Good luck to you all and thank you so much for visiting my blog! I truly appreciate your comments! Oh wow ! You're so creative ! This is beauuuuutiful !!!!!! 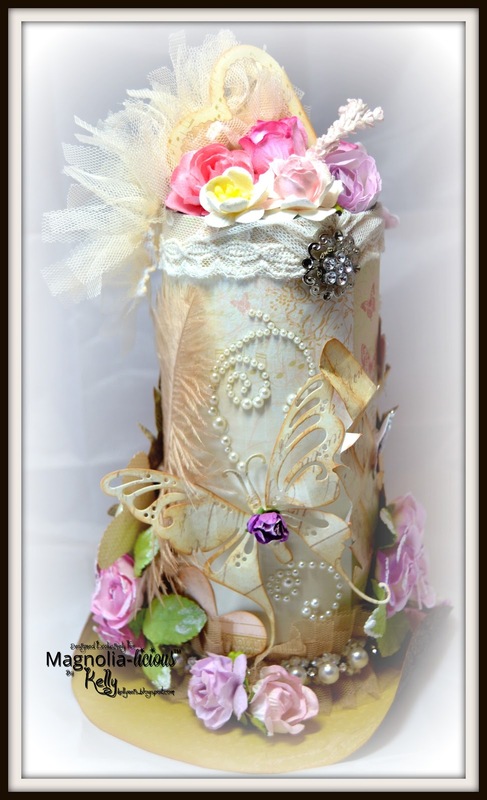 This is one gorgeous top hat!! You did an outstanding job Kelly! Great design and details. Looks like your kitty loved it too. Thank goodness you had pictures taken. Congrats to you once again!!! This is fabulous Kelly. Love the Tildas and your candle is beautifully embellished. Your project is a real work of art. Congratulations on the DT - very well deserved. I am the same as you - I cant believe I am a Ribbon Girl. BOO to the cat! It was utterly amazing, a feast for the senses indeed, no wonder the kitty liked it. 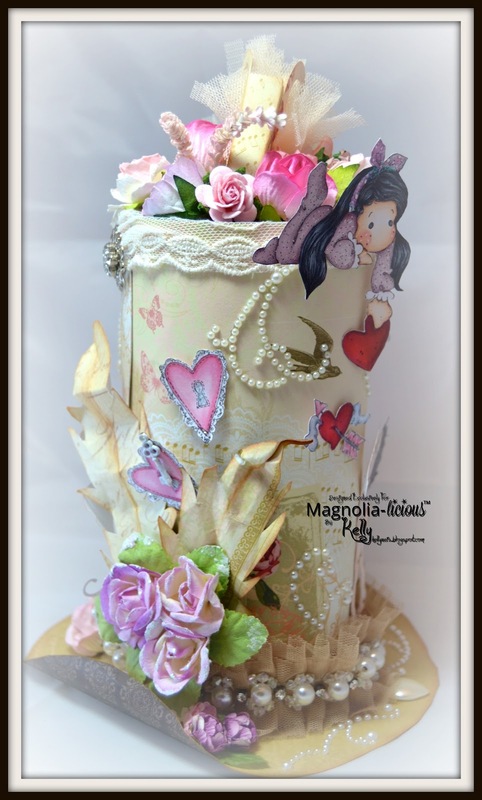 Love your use of the die cuts and pretty tulle. You did a wonderful job Kelly. I am so glad to have you on the team. I was wondering if this was the project your cat "played" with... will lotssss of attractive things there for a cat! no wonder. Beautiful project Kelly, fabulous decoration. Hugs. Gorgeous Hat! Beautifully embellished. Love your choice of stamps. Another fabulously dramatic creation - telling the story, drawing the eye from character to character... brilliant! I love how the top hat becomes a fairytale tower - wonderful. 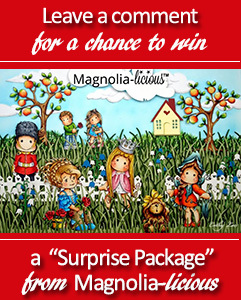 And so many congratulations on being on the Magnolia-licious team... that's such great news - for them too!